-Opt to wear a military vest instead of a denim jacket or cardigan. -Chose a bag that has a bright color or print. This will make the bag stand out against the plain shade. -Wear a longer necklace rather then short. Or layer a short simple necklace with a longer chain. This will add some statement to the tee without making it over dressed. -Add a pop of color with a colorful printed scarf. This can transition from day to night. 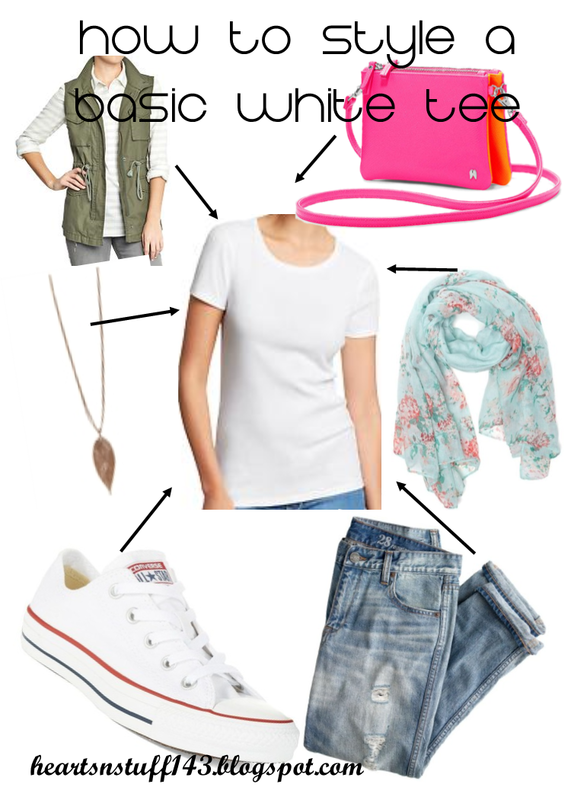 -Pair a simple Converse denim shorts or skirt to tie the white together. -Boyfriend jeans are everywhere right now. If you want to be stylish but not overdue it, this is a perfect match. What staple item do you find yourself wearing on repeat?